We offer contracts for small mole problems and large mole management. We can can be worked out either per mole caught, or per job. Moles can be a nuisance to most of us. You might wake up one morning to find your lovely lawn has been ruined overnight - or you may be the manager of a pristine golf course who wants to keep it that way – Either way, moles are a pest. Norfolk Pest Control Services can take care of your moles for you, whether you have just the one, or the whole family has taken up residence. 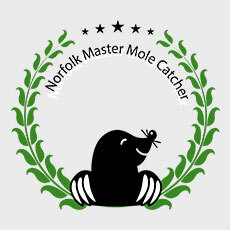 We work with Farmers and Estate Owners, Equestrian Centres, Airfields, Local Authorities, Sports Clubs, Cemeteries, Commercial Clients, Domestic Homeowners, and anyone else with a mole problem. We use environmentally safe traditional trapping methods with next day inspection as standard practice. These methods have been passed down my family from generation to generation and, unlike many other methods, they really work. If you have a mole problem, I can solve it for you, every time. If not there’s no fee. It’s a very cost-effective solution when compared to the potential cost of repairing the damage caused by an uncontrolled mole infestation. We work on a No Mole No Fee policy, which means you have nothing to lose and all to gain when using us to resolve your mole pest problem. To solve your mole problem with a safe and humane service that's fully certified, contact Mark Cotton on - Office: 01379 852 950.